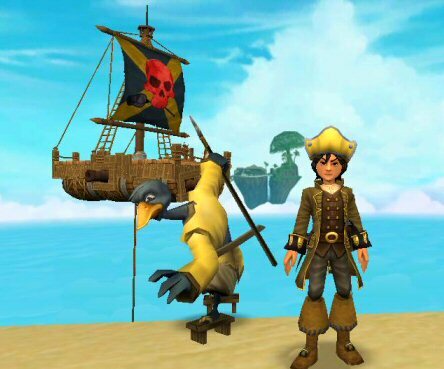 My ole friend Egg Shen and I finally had time to set out on our adventures from Skull Island. It’s been a much needed distraction from all the hard work that goes into being a Privateer. Seems you’re always trying to make deals, sell something, find new projects to get involved with and new deals to be worked out. If there’s one word that describes the life of a Privateer its Stress! But we finally took a day off and went out to discover what all the blamin’ blasting was about here on Skull Island. Come to find out, we’ve been under attack! As we were leaving the office we received a note from a friend of ours, One-Eyed Jack. Jack heard about our plans and sent one of his Cutthroat Pirates along to help out. 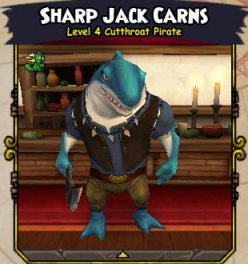 So before we’ve even left town, we have a new crew mate, Sharp Jack Carns. His brawn will be a good addition to my brains. He had a strange little fellow along with him as well. A Ninja Pig from Mooshu named Egg Pao. Seems he has some knowledge about Marco Pollo, but we don’t have time for that now. Now the first stop of any good Privateer is the office of the area’s boss. In the case of Skull Island that’s our old friend Captain Avery. We’ve had a few dealings in the past, so it was good to see him still alive. I mean it was good to see him again. We set out on some favors for Avery and found ourselves with another new crew mate. A lovely lass named Bonnie Anne. She’s pretty mean with a musket and good to have in a fight when you get into one. We discovered the sailor Avery sent us after had been missing for a while and we set out to find him. We found ourselves in Skull Cave and up against a hoard of cutthroat pirates. One of which we had heard about from our other Captain pals. Fin Diesel is his name and it seems he had stolen an amulet that belonged to Avery. We dealt with him straight away and returned the amulet to the Captain back in town, with Fin in tow of course. With that deed accomplished Avery asked for our help on another little problem he has. The hunt for Captain Gunn’s lost treasure. We headed off to the Kracken, a local tavern where all sorts of trouble can be found. And indeed we found it! As we were looking for the map to Gunn’s treasure, we discovered a dastardly pirate names Ratbeard had stolen the map. A fight ensued and Ratbeard got away. But our effort to acquire the map and stand toe to toe against that vile Captain earned us respect and another new crew mate. This fella is more my style. Clean, polite and even rather intelligent. A little otter fellow names Ensign Emmett. We reported back to Captain Avery. Avery being the untrustworthy scoundrel he is, promised us a ship for our trouble. A Ship? The lying cheat conned us into a puny little raft named the Groaning Scoundrel! Ship my eye! Oddly enough Egg Shen and his strange Mooshu wisdom looked at the boat as a good thing. At least it was free, it’s sturdy enough to sail through the skyway and it gets us off this blasted island! So we’re on our way to Blood Shoals to look for Captain Gunn’s treasure. We discovered a cave with several poor souls that had been murdered by Captain Ratbeard. I’ve met some terrible and devious captain’s in my day, but this one takes the cake! To murder your own crew?! We tried to help these poor souls find peace and finish up some business they left undone before they were so unfairly killed. We were able to put our new boat to the test in the skyways. A few ship to ship battles, a little fishing and a bit of traveling on the windlanes and man there’s nothing like the feel of the wind in your face as you’re piloting your own boat! With our mission complete on Blood Shoals, we’re off to Jonahtown to see my old mentor The Frogfather. So ends my first Captain’s log for the Groaning Scoundrel!